From thirteen Australian writers comes a collection of original speculative fiction short stories that will take you from the great unknown of our own planet, to the stars, and beyond to mystical fantasy worlds. These stories of ‘hope’ include High Tide at Hot Water Beach (Paul Haines), Burned in the Black (Janette Dalgliesh), The Haunted Earth (Sean Williams), Eliot (Benjamin Solah), Boundaries (Karen Lee Field), The Encounter (Sasha Beattie), The God on the Mountain (Graham Storrs), Deployment (Craig Hull), Flowers in the Shadow of the Garden (Joanne Anderton), Blinded (Jodi Cleghorn), The Choosing (Rowena Cory Daniells), Duty and Sacrifice (Alan Baxter) and A Moment, A Day, A Year… (Pamela Freeman). These brilliantly crafted stories, combined with essays donated by Beyondblue and Dr Myfanwy Maple and Mr Warren Bartik, from the University of New England, are accompanied by short snippets of information on suicide. Did you know approximately one million people die by suicide each year worldwide? Suicide happens on a daily basis. It can affect you. Are you suicide aware? 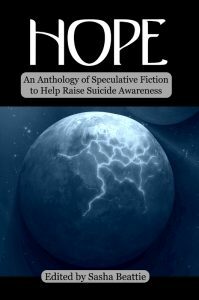 Everything in this anthology is donated by Australians to help raise suicide awareness. All profits will be donated to suicide awareness. Enjoyable stories and for a good cause. How can you beat that. I enjoyed reading the stories, which almost all feature an undertone or situations which can lead to a suicide, but time and again the main characters do find hope and thus a way into the future. The information about suicides and suicide prevention was short and to the point, which kept me reading and also sometimes pause and consider if the symptoms/situations described apply to me or people I know.